“The best preparation for living is to be prepared to die at any time … imminent death inspires clarity of purpose, a rearranging of what really matters” – Robert D. Smith, 20,000 Days and Counting, Kindle Locations 554 and 573. However, the book is anything but morbid. For this man, who has spent most of his career managing entertainer and author Andy Andrews knows how to show us a good time. The book’s tone and content is upbeat, encouraging, helpful, and practical. – You increase motivation by increasing productivity. – Take ownership. “Start thinking I am the problem … when you do that…. Suddenly you have power” (Kindle Location 771). The book is a fast read and worth every minute spent immersed in it. The few hours it took me to read it are already proving well spent in their impact on my 2013 goals and resolutions. This is a book that will clear your vision and help you live with a “So teach us to number our days that we may gain a heart of wisdom” mindset (Psalm 90:12—one of numerous Bible verses he quotes; the book is consistent with a Christian perspective). I recommend it! Publisher: Thomas Nelson, January 2013, 99 pages-Kindle edition, available in hardcover. 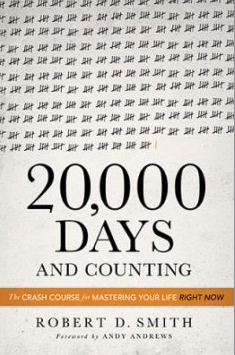 I received 20,000 Days and Counting as a gift from the publisher for the purpose of writing a review.